It aims to make road, airport and dockyard pavements smart, low cost, long-lasting, safe, green and adaptable to future transport demands. Australia’s $300 billion road network, the basic infrastructure upon which the nation depends for its economic and social prosperity, is currently at risk of degradation due to increased passenger and freight traffic, and a scarcity in materials and expertise scarcity. Our roads are currently unprepared to meet these future demands. Advanced design and construction specification, test methods and smart integrated asset management. The Hub will deliver new materials and modelling, smart construction, and rehabilitation systems required for future demands, while improving road safety and reducing environmental impact. The project is a partnership between several industry organisations, peak bodies and universities both local and international. ARRB is an industry partner in the project. Led by Professor Jayantha Kodikara of Monash University, the team includes chief investigators from across Monash, including Professor Jeffrey Walker, Professor Hai Vu, Professor Malek Bouazza, Dr Ha Bui, Dr Ye Lu, Dr Yihai Fang, Dr Xu Yang from Civil Engineering, Professor Chiu Wing Kong from Mechanical and Aerospace Engineering, Dr Andrey Molotnikov from Materials Science and Engineering, Professor Mark Wallace and Dr David Albrecht from the Faculty of Information Technology and Dr Selby Coxon from the Faculty of Art, Design and Architecture. 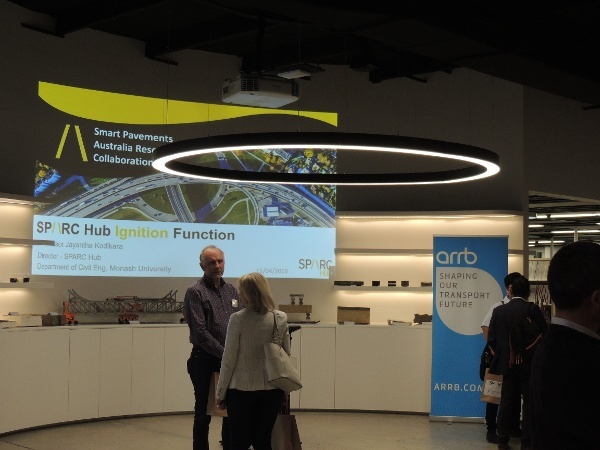 SPARC Hub also includes 30 investigators from other Australian and international universities, and researchers from ARRB including Chief Research Officer Dr Mike Shackleton. Twenty industry partners are involved, including ARRB, EIC Activities and Austroads.